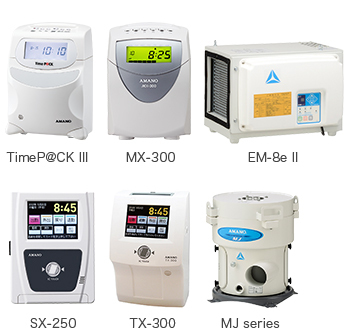 Amano products are mainly manufactured at the Sagamihara factory and Hosoe factory. Both factories strive to perfect their Q (quality), C (cost), D (delivery) to ensure high competitiveness on an international level and also are constantly working to improve parts procurement, production management, manufacturing, and distribution. After mounting electronic components on the printed circuit boards, a quality check is performed with an visual inspection device to verify the state of soldering and to ensure there are no floating leads on the IC. During the shipping inspection process for finished products, a full product function check is made. An anechoic chamber was built at the Headquarters for EMC testing in order to assess the conformity to international standards. To ensure product reliability, tests are done under temperatures of the installation environment. In addition, we have formulated the "RoHS Restriction Management Rules" as one of our environmental in-house guidlines that allow us to confirm the RoHS compliancy of our products and to obtain JGP files. We are also implementing measures to comply with the Revised RoHS Directive that was enacted in January 2013. This directive was implemented in the European Union (EU) on July 1, 2006, with the aim of restricting the use of specified hazardous substances—including lead, hexavalent chromium, mercury, cadmium, polybrominated biphenyl (PBB), and polybrominated diphenyl ether (PBDE)—in electrical and electronic products.